My-Space Video of the return of "Sgt" Jim Nelson! For a time, Boris Zhukov was one of the most reviled villians in wrestling. 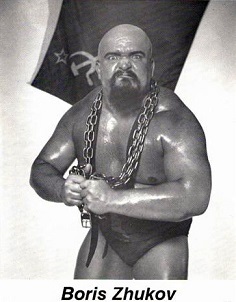 As a fully-believing Russian heel during the last vestiges of the Cold War, Boris (along with his long-time partner, Nikolai Volkoff) earned many boos just by carrying out the Russian flag before matches. The most ironic thing about Zhukov's career in wrestling, though, is that he first made a name in the business as an American patriot... who was also a heel. The man who would become Boris Zhukov began in 1978, when he began working towards a wrestling career in Roanoke, Virginia, under the tutelage of men like Ric McCord, Steve Savage, and Eclipso. His first match was in May '78 against Chief Greywolf in New Castle, the start of his long-running career in the business. In the late '70s, Jim Nelson began making a name for himself in the independents, including spending some time in NWA Georgia Championship Wrestling and Jim Crockett Promotions. In the early '80s, Nelson became "Private Jim Nelson", under the command of Sgt. Slaughter, who had come over from the WWWF to join the NWA Mid-Atlantic squad. Along with Private Don Kernodle, the force, referenced occasionally as the Cobra Corps, went to war with various babyface groups in the territory. For the most part, the Privates (or PVT's) teamed up to support Sgt. Slaughter in his run with the NWA United States Heavyweight Title. At the same time, the PVT's formed a good team of their own, winning the NWA Mid-Atlantic Tag-Team Titles in May '82 from Porkchop Cash & Jay Youngblood. It was a short reign for the squad before Porkchop Cash & King Parsons took away the belts again, but the PVT's weren't done, with Nelson & Kernodle winning the gold back in June '82. This reign would last a little longer, with the PVT's holding the belts until August, when they lost to Ricky Steamboat & Jay Youngblood. Soon afterwards, Slaughter & Kernodle teamed up to win the NWA World Tag-Team Titles, while Nelson began concentrating on the singles route, winning the NWA Canadian Television Title in October '82 from Youngblood. He would hold the belt for two months before falling just after Christmas '82 to Terry Kay. 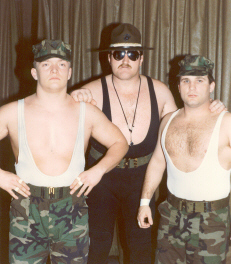 In March '83, Private Nelson and Sargeant Slaughter had a falling out, with Nelson being kicked out of the group. This turned Nelson face, as he won the NWA Canadian Television Title again shortly after the turn, holding the belt for the next few months before leaving the Toronto-based organization. Before long, Nelson would leave the Mid-Atlantic area as well, after an injury angle with a now-heel Jack Brisco. Nelson confronted Brisco about injuring Ricky Steamboat, but then was taken out himself by Brisco, who took out Nelson's leg. With the injury, Nelson would disappear from the wrestling business. In his place, a patriotic Russian appeared, going under the name of Boris Zhukov. Zhukov would tour around the independent scene for a while, winning some more gold when he won the NWA Alabama Heavyweight Title in August '84 from Rick McGraw. Unfortunately, Zhukov's old rival, Porkchop Cash, was able to take the belt from him a month later, ending Zhukov's reign as the champ. Zhukov continued to move around for the next year, before getting his big break in the American Wrestling Association. With Chris Markoff as his manager, Zhukov immediately became a major heel in the AWA, feuding with his former partner, Sgt. Slaughter, among other babyfaces. Zhukov was later managed by Sheik Adnan Al-Kassey and teamed up with Soldat Ustinov, another foreign heel. The two won the AWA World Tag-Team Titles in May '87, taking down the Midnight Rockers for the belts. The two were a powerful tag-team, as no one was able to get the belts from them for months. However, in September '87, Zhukov was approached by the World Wrestling Federation, and decided to jump, vacating his share of the title. This was explained, storyline-wise, by Zhukov being chased out of the AWA after a brutal chain match with Wahoo McDaniel. Zhukov immediately formed a Russian tag-team in the WWF, joining with Nikolai Volkoff as the Bolsheviks, managed by Slick. Unfortunately, despite being a great heel team, the Bolsheviks became more well-known for their singing the Russian National Anthem than having success in the ring. Zhukov's only gold he won was a Slammy Award in '87 for "Best Personal Hygiene". One of the Bolsheviks' most infamous moments came at Wrestlemania VI in April '90. First, the two had an interview segment in the back with comedian Steve Allen, who embarrassed them while they were trying to rehearse for their singing. The duo then headed to the ring to face the Hart Foundation. Before they could even finish singing their national anthem, Bret Hart & Jim Neidhart attacked, taking out the Bolsheviks within 20 seconds! Not long after their historic defeat, the Bolsheviks broke up, with Nikolai converting into an American ally, while Zhukov stayed a heel Russian. Despite the change, though, things didn't get better for Zhukov, who rarely got a victory in the WWF after the breaking-up of the team. Zhukov also had injuries building up, from a painful hernia injury to pains in his knees and shoulders. After leaving the WWF in '91, Boris worked part-time in the independents for years, eventually retiring for a time in 1998 when he went in for hernia surgery. In 2001, Zhukov returned to the ring for special events, continuing to work in the independents as both a wrestler and a manager. He joined New Age Championship Wrestling in 2005 as a manager for the Tag-Team Champs, Eddie Loco & Dusty Storm, while also wrestling occasionally himself. Things took another turn for him, though, in September '07. Zhukov had been feuding with the ACW Universal Champion, Eclipso, over the gold, leading to a match being signed that required an injured Zhukov had to face Eclipso, or be forced to retire. Zhukov shocked the crowd by coming out and announcing his retirement, apparently giving Eclipso the forfeit victory. However, when it came time for Eclipso's match, he was shocked to discover that a newly-promoted Sargeant Jim Nelson was ready to go! Nelson used the surprise to his advantage, managing to defeat Eclipso to become the ACW Universal Champion! Unfortunately the reign only lasted a short time, as Douglas Wentworth III found a legal loophole to cause the belt to be held up. In the rematch, Eclipso was able to use dust to blind Nelson and nailed him with a rigged glove, taking away the belt. Eclipso also said that there would be no rematch. Fortunately for Nelson, the legendeary Johnny Weaver was on his side, tricking Eclipso into signing a contract. Eclipso thought it was for a match against Weaver, but it was actually against Nelson! This time, Nelson used Eclipso's own glove against him, winning the match and becoming the champion for the second time! The two had a final "No Rematch" match in December '07, with Jimmy Valiant as the special referee. Eclipso tried to cheat again, using brass knuckles to knock out Nelson for the win. But Valiant discovered the knuckles and disqualified Eclipso, allowing Nelson to keep the belt. Eclipso and Wentworth tried to attack Valiant afterwards, but Valiant fought them off. Since then, Nelson has continued to wrestle in the ACW, continuing his run as the new Sargeant of the wrestling world. - Mid-South Superdome Extravaganza (July 16, '83) = Boris Zhukov & Mr. Olympia fell to Tim Horner & Mil Mascaras. - WCCW Thanksgiving Star Wars (November 24, '83) = Zhukov, Black Gordman, & Tonga John were beaten by Jose Lothario, Johnny Mantell, & Mike Reed. - AWA/NWA Star Wars (August 16, '85) = Zhukov lost, via DQ, to Brad Rheingans. - AWA SuperClash (September 28, '85) = Zhukov lost, via DQ, to the AWA Americas Heavyweight Champion, Sgt. Slaughter. - AWA/NWA Star Wars (December 29, '85) = Zhukov & Chris Markoff lost a "Handicap" Match to Sgt. Slaughter. - AWA/NWA Rage in a Cage (April 28, '86) = Zhukov & Konga the Barbarian lost to the AWA Tag-Team Champions, Scott Hall & Curt Hennig. - WWC Universal Heavyweight Title Tournament (September '86) = Zhukov lost in the first round to the eventual winner, Carlos Colon. - AWA Brawl in St. Paul (December 25, '86) = Zhukov fell to Steve O. - AWA SuperClash II (May 2, '87) = Zhukov was pinned by Jerry Blackwell. - WWF Survivor Series '87 (November 26) = The Bolsheviks (Zhukov & Nikolai Volkoff), Demolition, the Hart Foundation, the Islanders & the New Dream Team fought in an "Elimination" Match against Strike Force, the Fabulous Rougeaus, the Killer Bees, the Young Stallions & the British Bulldogs. The Bolsheviks were eliminated by Strike Force. The Killer Bees & the Young Stallions 'survived'. - WWF Saturday Night's Main Event #14 (December 7, '87) = The Bolsheviks lost to the WWF Tag Champs, Strike Force. - WWF Royal Rumble '88 (January 24) = Zhukov competed in the Royal Rumble, which was won by Jim Duggan. - WWF Wrestlemania IV (March 27, '88) = Zhukov competed in a "Battle Royal", which was won by Bad News Brown. - WWF Wrestlefest '88 (July 31) = The Bolsheviks were beaten by the Powers of Pain. - WWF Summerslam '88 (August 29) = The Bolsheviks fell to the Powers of Pain. - WWF Saturday Night's Main Event #18 (November 16, '88) = Zhukov lost a "Flag" Match to Jim Duggan. - WWF Survivor Series '88 (November 24) = The Bolsheviks, Demolition, the Fabulous Rougeaus, the Brain Busters, & the Conquistadors fought in an "Elimination" Match against the Powers of Pain, the Rockers, the Hart Foundation, the Young Stallions, & the British Bulldogs. The Bolsheviks were eliminated by the Rockers. The Powers of Pain were the sole 'survivors'. - WWF Saturday Night's Main Event #21 (April 25, '89) = Zhukov fell to Jimmy Snuka. - WWF 1st UK Event (October 10, '89) = Zhukov was pinned by Koko B. Ware. - WWF Wrestlemania VI (April 1, '90) = The Bolsheviks were quickly beaten by the Hart Foundation. - WWF Survivor Series '90 (November 22) = Zhukov, Sgt. Slaughter, & the Orient Express fought in an "Elimination" Match against Nikolai Volkoff, Tito Santana, & the Bushwhackers. Zhukov was eliminated by Santana, who was the sole 'survivor'. - UWF Beach Brawl (June 9, '91) = In a dark match, Zhukov took down Paul Samson.